The red, black, yellow and white combine the national colours for Canada, China and Germany. 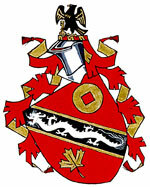 The colour reference to Germany is for Mr. Mak’s early years in Kitchener, Ontario, which was settled largely by German immigrants. The dragon symbolizes China and is based on a design taken from a silver chopstick holder. The maple leaf honours Mr. Mak’s Canadian heritage. The gold disc with the square hole resembles an ancient Chinese coin, and thus refers to Mr. Mak’s profession as a chartered accountant. The black eagle is another reference to Germany and Kitchener, Ontario. The gold key was a medieval symbol for accountants. Keys also appear in the Arms of the Institute of Chartered Accountants of Ontario, of which Mr. Mak is a member. 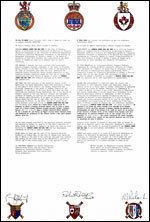 The announcement of the Letters Patent was made on May 12, 1990, in Volume 124, page 1689 of the Canada Gazette. 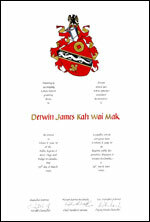 Original concept of Derwin James Kah Wai Mak, assisted by the heralds of the Canadian Heraldic Authority.